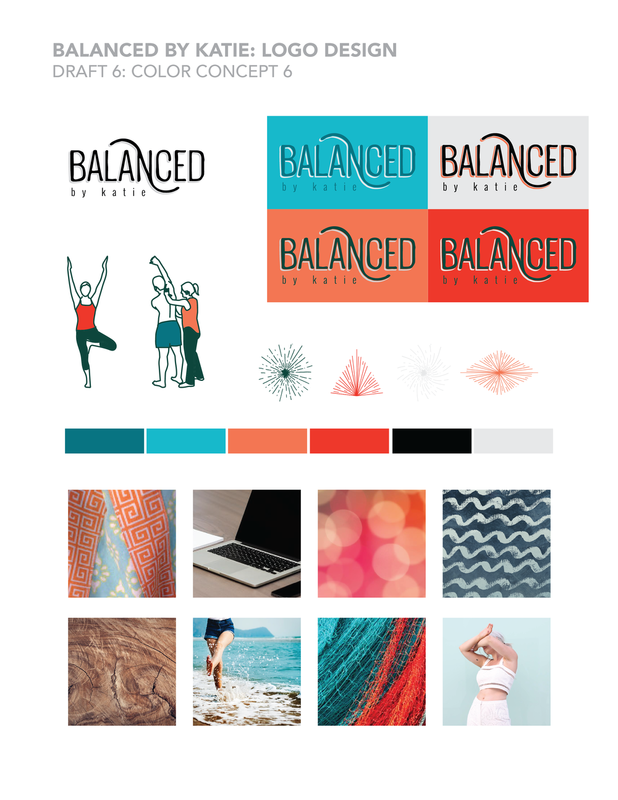 From Concept to Completion: Brand Design for Balanced by Katie — MKW Creative Co.
From my first meeting with Katie D'Amato of Balanced by Katie, I knew this was going to be a brand design I couldn't wait to share. Katie found her way to me via Boss Babes Brunch Club (shoutout to these ladies, if you don't know them yet, you should) and had seen the branding I had done for Right Hand Business Coach and Simple Wellness Co. Katie is a DPT, RYT and CAFS + probably many other acronyms. As a yoga instructor and physical therapist, Katie's tagline is 'grounded to heal and empowered to move.' Which became the cornerstone of her brand design. 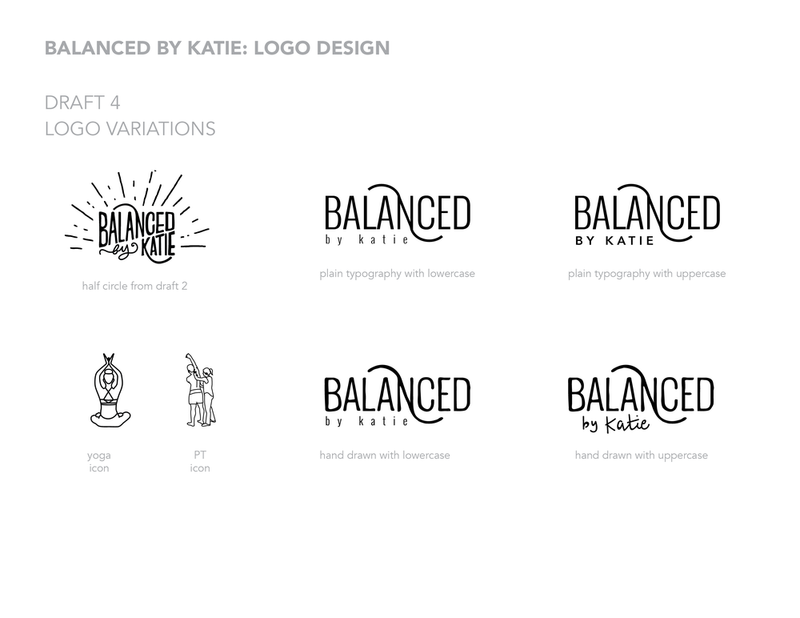 This process went a little longer than usual (we had our initial consult back in July) but it was really important that we get this brand design RIGHT for Katie. My goal when I design a brand is for it to be a collaboration between me and my client. I want to take their vision and values alongside their visual inspiration and create a beautiful and meaningful identity that they can be proud of. Take a peek at the whole process below! The first draft of a logo/brand design is a brain dump of everything that could work based on the initial consult. As I mentioned above, there were certain elements that we knew we wanted incorporated. I was able to achieve the hand drawn text look by outlining the font, and manipulating the text with my Wacom Tablet, a hack I learned from my fave, Dazey LA. (See a whole list of my favorite tools for biz here). Ultimately, concept 1 was the winner from this round, so that's what we expanded on for draft 2. We loved how the arch from the top of the N and bottom of the K could be explained as the tagline grounded to heal (reaching downward) and empowered to move (growing upward) and kept that as the ongoing element throughout the design process. Now, we are getting somewhere. The half circle from Draft 2 seemed plausible, but now the 'by' was distracting. We thinned out the stroke on the lines, sized down the 'Katie' and then started to realized that this mark was looking far from balanced. 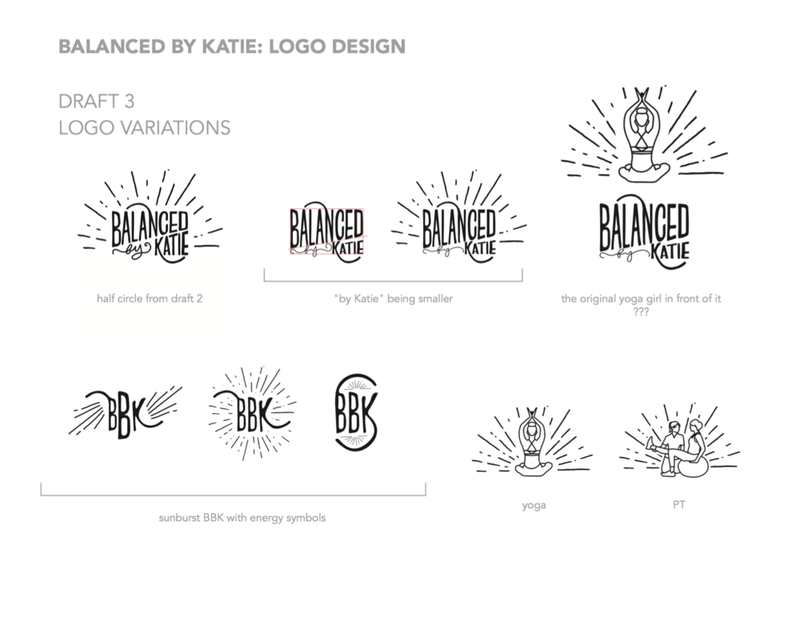 We played with submarks using BBK and realized that again the emphasis was misplaced since 'Balanced' is the driver of the business name and that 'by Katie' should be less emphasized. Normally, the 4th draft should be the approaching the final color variations but at this point, we weren't quite there. 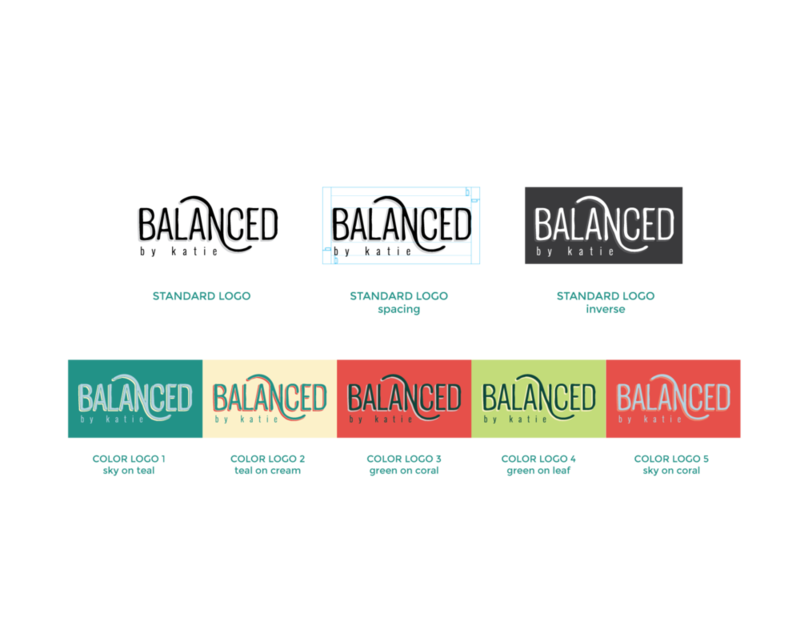 Instead, we broke 'by Katie' onto its own line and then used the arched wave embellishments on the word 'Balanced.' 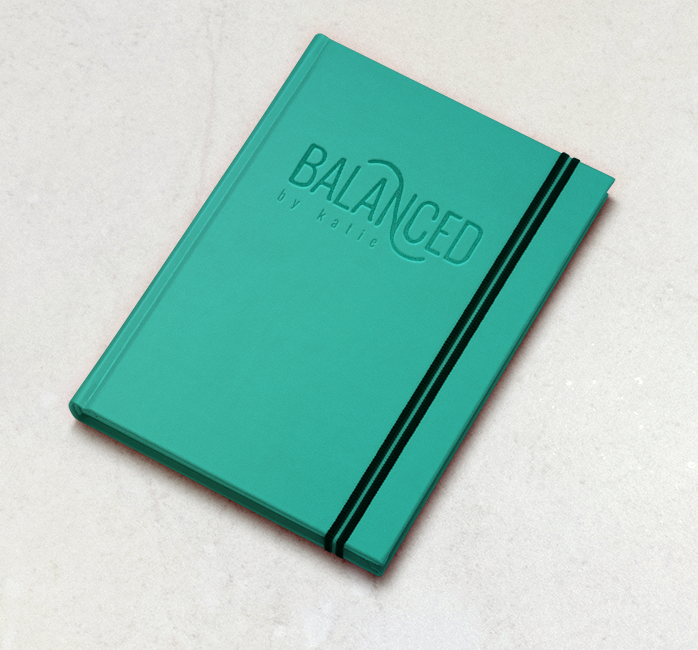 Keeping the emphasis on Balanced allowed for a much cleaner and ... balanced... design. Again, I was able to manipulate the text to add back in those hand drawn edges and wrote out 'by Katie' in my own handwriting. We were on to something here! The icon for PT here was a winner! Woo! Little victories! We finally felt confident with the logo drafts to head into a color variation phase. Keeping in mind that Katie wanted lively colors and energetic illustrations, we went through a lot of color options before we arrived at the final colors. Lastly and definitely not least, are the COLLATERAL MOCK UPS. I started doing these not so long ago with photoshop templates I found online. The great thing is that they really help to bring the brand together in a way that makes it feel like it's really real. You can see more brand design projects like this (using similar collateral mock ups) here. Tell me your thoughts on how this turned out! 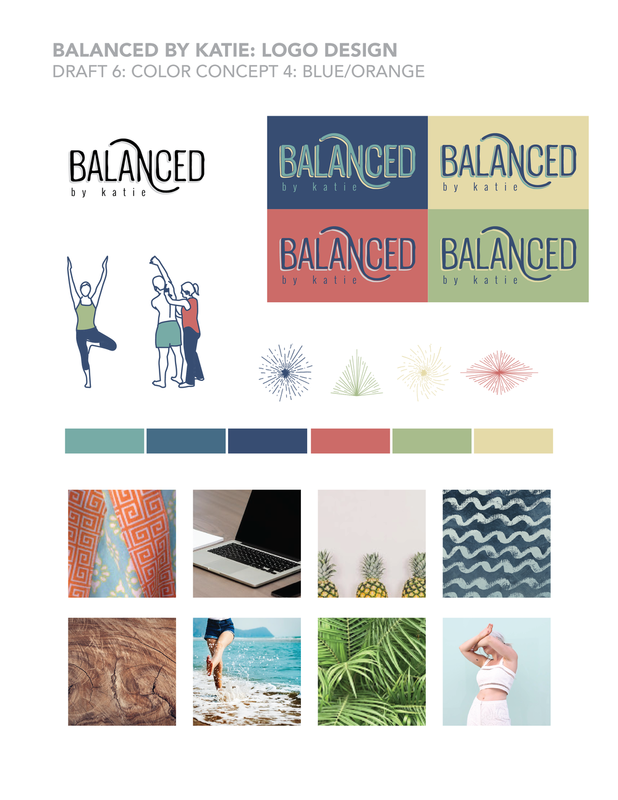 Leave me a comment below + Be on the lookout for Balanced by Katie's new branding IRL!